The goal is to always dream your dream, then build your dream. Barbara Hamilton, mother and grandmother is doing just that. Wanting to make a difference on a variety of levels for a number of causes, she started a nonprofit organization last year to do that. Where did the concept of GudbyeDawg come from? The concept for Gudbye Dawg came from Hello Kitty, she’s loved by young girls to the not so young girls. I thought why not have something for the young boys to the not so young boys to love also. I wanted a dog – opposite of the kitty. You chose a pitbull as the GudbyeDawg character. You said you wanted to help change the pitbull stigma. Why is that so important to you? Many dogs came to mind to use however I thought the Pit Bull would be the perfect dog to use to represent my company. Society has placed such a bad stigma on such a nice animal. Pit Bulls by nature are not bad dogs. They are just like any other breed of dogs and it’s all about how they are raised. The bad reputation needs to be softened and eliminated, just like the diseases that our Gudbye Dawg represents. Speaking of diseases, the dog bone colors on the shirts reflect the different organizations that people can choose to wear/sponsor through Gudbye Dawg. Which colors represent which organizations? Breast Cancer – Pink Bone, Autism – Red Blue Yellow, Heart Disease – Red, Alzheimer’s – Purple and last but not least, Animal Cruelty – Silver. The bone in the dog’s mouth takes on the color of the causes. So how does the Gudbye Dawg organization work to help eradicate illnesses? We donate 20% of all purchases to the organization that the purchaser chooses to sponsor. So, if you want to donate to an animal cruelty organization, you would purchase one of our shirts or other merchandise and receive the Gudbye Dawg with the silver bone. Why have you chosen the specific charities that you sponsor? There are many great foundations out there and it was a tough choice. However, I chose the ASPCA, Alzehimer’s Foundation of America, American Heart Disease, Autism Society, and the Beast Cancer Research Foundation because I feel they held the best representation. The majority of the donated funds go straight to funding research. You have a background in working with autistic children and you mentioned that has stayed with you. Did that influence your decision to create a charitable organization? Yes. I worked with Autistic children for some ten years and those children became my children. It never left me and I always wanted to find some way, no matter how big or small, to help them. I also have close friends who are right now fighting their bouts with Breast Cancer. This too influenced me to want to make a difference. I love to be able to say Gudbye Dawg had a tiny part in helping get rid of these diseases. GudbyeDawg is to be a collector’s item for little boys. Do you have plans to have stuffed animals available in the future? I have looked into making a stuffed animal of Gudbye Dawg. Hopefully it will be in the very near future. I would love that. What are your other goals for your organization? My goal is to take my company nationwide and make Gudbye Dawg a household name, to have men and women, young and old supporting their favorite cause with a Gudbye Dawg bone. That would be wonderful . Thank you for giving me this opportunity to talk about my company. For more information, check out http://GudbyeDawg.com. Gudbye Dawg is proud to support charities that impact the friends and families of those that enjoy wearing Gudbye Dawg swag proudly. Gudbye Dawg is dedicated to saying good-bye to the illnesses that affect our friends and loved ones. That’s where the idea of Gudbye Dawg came from … telling these illnesses that it’s time to go. The American Pit Bull Terrier has long been a brave and courageous protector of American families. With Gudbye Dawg swag, you can let the world know the proud heritage of this much misunderstood breed, while supporting the research that will ultimately allow people to say their final good-bye to a disease that may be affecting their life, or the lives of friends and loved ones. We don’t know who will be struck down next with heart disease, Alzheimer’s, autism or breast cancer. It could be one of us…or one of your friends…or a family member…or even you. Maybe you already know someone affected by these illnesses. What is certain is that, until research gives us a way to say good-bye to these diseases forever, we are all at risk. 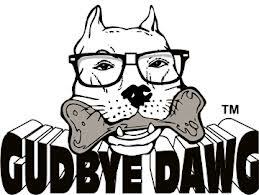 Buying Gudbye Dawg swag will help to further research that may save the life of someone you love – or even your life. It’s a good thing to do for those you love and even those you have yet to meet.